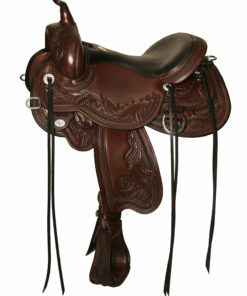 The Topeka Flex2 is a great choice for a trail saddle and a favorite among trail riders. 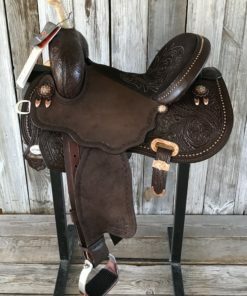 It’s uses our most popular Flex2® trail tree which has a 4″ cantle and 13″ wide swell to provide a moderate seat, the standard in all-day comfort. The 3-way in-skirt rigging lets you choose which rigging position best suits your horse. Impact Foam™ in seat keeps you comfortable all day in the saddle. Available in regular or wide tree width. The coordinating saddle pad cut in the full skirt shape with matching wear leathers completes a pulled together look for your horse. Hand tooled shell border with silver slotted conchos and stainless steel hardware.